Whether a full motorcycle licence holder, taking compulsory basic training (CBT) or taking the DVSA module 1 off-road test, you’ll need to know how to make a U-turn. As a learner or fully licensed motorcycle rider, you’ll often need to turn your motorcycle round in the road to travel in the opposite direction. Referred to as a U-turn, your initial training for this manoeuvre will typically start with CBT element C.
Whilst making a U-turn, it’s essential that consideration is given to other road users and pedestrians, and that due care is taken for ones own safety. This can only be achieved with good control of the vehicle and effective observation throughout. To gauge the level of control and safety during the U-turn, a DVSA examiner will assess you during the Module 1 off-road riding test. This tutorial explains how to perform a slow control exercise, the U-turn safely, using effective observation to an appropriate standard for Module 1. This diagram details the location of the U-turn manoeuvring area within the module 1 course layout, based on the right circuit. U-turn position will be on the opposite side for the left circuit. The distance from the second blue cones to the end of the lines is around 13.2 metres and the width between the lines, the area in which the U-turn must completed is 7.5 metres. The examiner will explain to you with the aid of a diagram that they would like you to ride along the line, to carry out a U-turn and to come to a stop on the other side. The examiner will ask you to treat this circuit as though you were on the road. 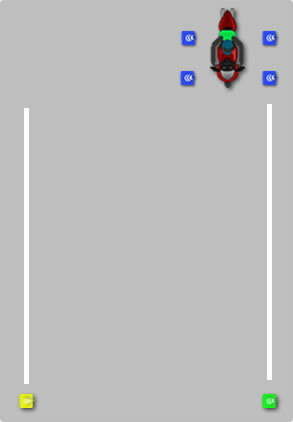 The white lines represent curbs on a public road, so avoid riding on the lines. 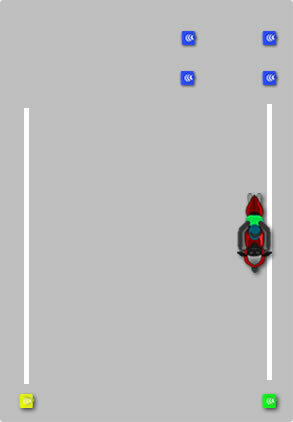 Whilst doing the U-turn, keep the motorcycle slow, something similar to a brisk walking speed. Too slow may however make you lose balance. After the examiner has explained the manoeuvre procedure, get the motorcycle ready and select first gear. Module 1 can easily be failed by a lack of effective observation. Before moving off, ensure you check the blind spots. Motorcycle blind spots are areas that you cannot see in your mirrors. Check over your left shoulder, followed by your right shoulder and then move off. If for any reason you are unable to move off and there is a delay moving off, (you didn’t prepare the motorcycle correctly for example) don’t forget to check the blind spots again (often referred to as life saver glance). In a real-life situation, the shoulder checks are to ensure no other vehicles are coming before moving off, or no pedestrians are moving out into the road. As you begin to move off, position yourself closer to the line, but avoid riding on the line. Positioning yourself closer to the line will effectively make the turning circle as large as possible, therefore making the U-turn easier. Roughly around halfway and before making the U-turn, check over your right shoulder. This is to ensure you do not move out into the path of vehicles approaching from behind. Again, this blind spot ‘life saver’ check is essential for passing module 1. Just before making the U-turn, look ahead once again as this will help you gain stability. 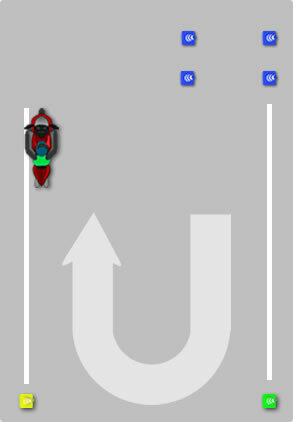 As you make the U-turn and begin to face in the opposite direction, position you motorcycle close to the line, again to make maximum use of the available distance between both lines. Also bring your motorcycle to a stop right towards the end of the line, again to make maximum use of the available space. Once stopped, put the vehicle into neutral.